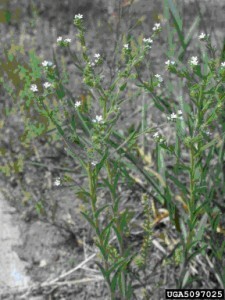 Western sticktight is a native plant that is common to the prairies west of the Mississippi (USDA, 2014). 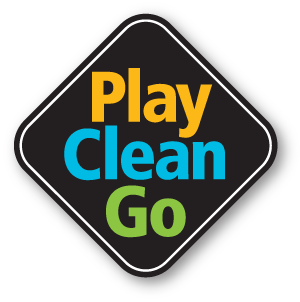 It occurs in a variety of sites mostly associated with gravelly well-drained soils and is common along roadsides, trailheads, and pathways. It is an annual. 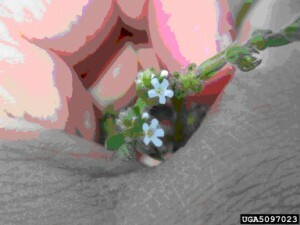 The blue, light blue, or white flowers are small with five petals. The flowers produce numerous seeds that are burs and travel well by attaching to clothing or fur. The leaves alternate on the stem and are narrow and long. The entire plant is covered with fine hairs. Sticktight stems tend to be darker in color and can occasionally be red to brown, especially as the plant nears maturity. It has a simple taproot. Western sticktight is a common component of ‘western wildflower’ mixes and is often labeled as a forget-me-not. Additionally, there is an introduced species that can occasionally be found called European sticktight. It is much taller, the seeds are larger, and it is found in areas with more moisture.